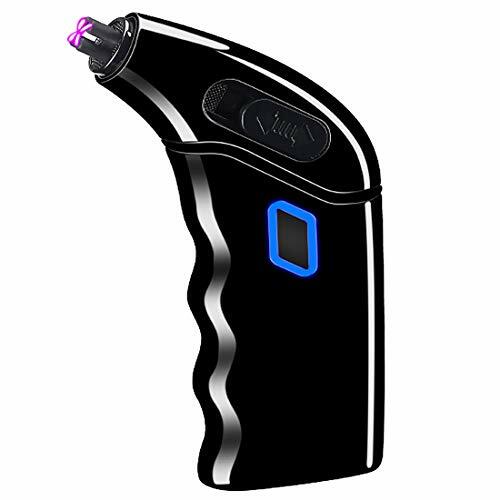 Double Arc Lighting Ignition, Metal Curved Body, more efficient, Good hands feel; Easy to start a ignition with one touch, flameless, no need gas, environment friendly. USB Rechargeable, easily connected with the computer, portable battery, phone charger and other standard USB port. Only need 1 to 1.5 hours to finish fully charge. 2 safe switch design, one is for protection lid and another is for ignition, which are to protect use safety no matter you are indoor or outdoor, can be kept on flight. Windproof,can be used in any weather. And it can lit up about 300 times when full-charged. Cool and Fashin Design. Perfect Size ( 100mm x 34mm x 17mm) to make it easily carried with you for indoor or outdoor activity, like cigarettes, cigars, camping, sitting at the bar.